This document will provide you with a summary of the top business-related bills that the Florida Legislature dealt with during the recent legislative session. 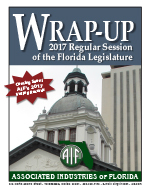 Compiled by AIF staff, the 2017 Session Wrap-Up lets you know what happened on some of the top issues and how your business could be affected. This session, AIF faced a variety of tough issues on behalf of Florida’s business community, including opposing measures that would have made it more expensive for businesses to operate, such as prejudgment interest, and fighting to preserve the insurance premium tax salary credit. Furthermore, AIF and its members knew that workers’ compensation was going to be a big issue for employers this session. In preparation for this, AIF organized an impressive array of business leaders from around the state to form the AIF Workers’ Compensation Strategic Task Force. Our Task Force members and AIF Lobby Team worked diligently with key legislators to try and find viable solutions. A proud advocate for Florida’s business community, AIF actively engaged on measures aimed at fostering continued growth and development such as reducing the business rent tax, making 5G wireless technology availability a reality and protecting productive, private agricultural land. It is our hope that you will find this publication helpful and informative for you and your company. If you have questions, please feel free to contact our legislative team at aif@aif.com.